The study of history informs both the present and the future. The worst of our past can act as a cautionary signal. One might hope that technological progress converts to moral improvement, but humans remain unchanged. What happened once can happen again. We are no better now than we were before. The best we can hope for is that we can learn from experience, but even that is questionable. Maurice Rajsfus, a French journalist and social activist, has spent his career researching, writing and teaching about the crimes of the Vichy regime during the Nazi occupation of France during the Second World War. He lived through those frightful times and lost his parents in Auschwitz. 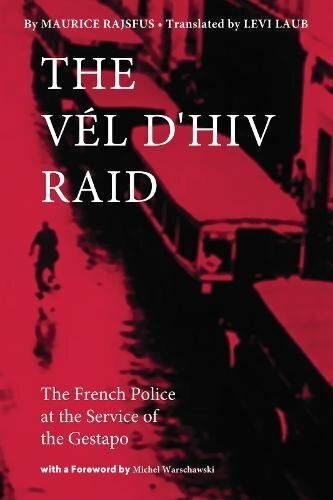 In his retelling of the Vel D’Hiv raid during which French police rounded up thousands of French Jews for deportation to the death camps, Rajsfus presents the hard facts that support his conclusion that during those two days in July 1942 the French police committed monstrous crimes against humanity. A total of 13,000 Jews were imprisoned at a Paris sporting arena, the Vélodrome d'Hiver, without water, food, or sanitary facilities. Conditions were barbaric. This condensed publication includes a remarkable collection of primary source documents, including memoranda, arrest records, police decrees, and contemporary newspaper accounts. The documents speak powerfully about the institutionalized evil of the French regime. By their voluntary actions, the French police showed they were eager to rid their country of Jews. They sent their neighbors to the gas chambers. The English translation of Rajsfus’s work arrives at a time when the United States and other Western democracies face significant decision points. There has always been a residual base for the extreme right wing in France, now led by Marine Le Pen. Le Pen has repeatedly insisted that France was not responsible for the wartime roundup of Jews who were sent to Nazi death camps. She should read Rajsfus’s work, although it is unlikely to alter her unfounded conclusions. Her loss in the recent French national elections provides a temporary reprieve, but no one should believe that Holocaust deniers and Neo-Nazis will soon depart the public arena. The American political system has now presented our country with its greatest threat to rights, liberties, and democracy itself since the Civil War. There is good reason to focus on the menace that Donald J. Trump poses to the nation as a whole. He centered his bombastic campaign for president on the enduring racism of the American polity. As president, he periodically reminds us of his villainous core. Without much courage shown by our other political leaders, it has fallen to the media to disclose Trump’s egregiousness. Does that mean that Donald Trump intends to follow Hitler’s leadership path? That seems unlikely. Trump will create his own serpentine route to absolutism. Hitler wrote Mein Kampf while in jail, and the German people knew exactly what they were getting when he took power. Trump, on the other hand, is a man without any quintessential principles. It is unlikely he would read Mein Kampf let alone write it. Rajsfus’s work about the French treachery was completed years before Trump’s ascendancy to power. Its importance is to alert us to be attentive and vigilant. When must we act to save our country? Many have already concluded that Trump’s evil ways require active resistance. Others find his actions and words beyond the pale of acceptability, but still are not ready to mobilize or seek his removal from office. When is it time to leave? Many Muslim immigrants have already escaped north to Canada. Where is the line? Rajsfus implicitly warns us that there will be many fellow travelers who will follow Trump through the swamp in order to wreck the American experiment. Those who fail to act to protect our republic in a timely fashion may be too late.